“Mayday Mayday”, not what we were quite a expecting to hear five minutes after turning on the radio to listen out for friends to make tonight’s dinner arrangements. “We see two people in the water calling for help, we are approaching the southern end of Bora Bora, we will attemp to sail back to them”. It turned out to be three divers, their dive boat had dragged its anchor and they surfaced from their dive to find it being blown by today’s brisk breeze inexorably out to sea. The yacht on the radio, Kiora, managed to get back to them and get them onboard, lucky guys, the sea is not friendly outside of the reef. It was nice on arriving in Bora Bora last Tuesday, to find three or four boats we know moored in the bay just south of us. That night everyone was going in to the centre of Vaitape, the capital of Bora Bora, to see the Polynesian dancing. The fortnight leading up to 14th July, Bastille day, is a big celebration here, called the Heiva it is a competitive celebration of French Polynesian culture. 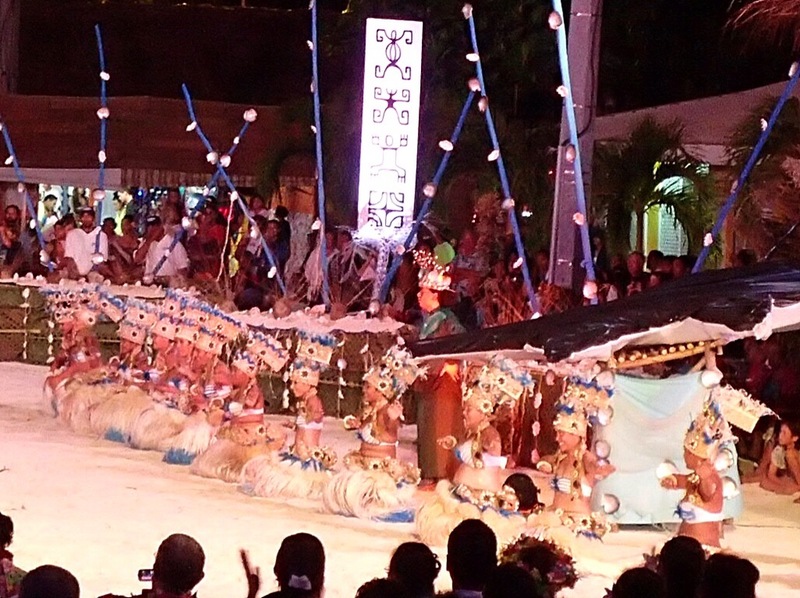 Each day there are competitions, canoe racing, tapas fabric exhibitions, palm weaving demonstrations as well as sports such as volleyball and beach soccer, most important are the inter-island traditional song and dance competitions. Ever since our arrival in the Marquesas the importance of music here has been obvious, the unforgetable noise of the traditional drums has been the backing track for our stay. It seems every commune (equivalent of our boroughs) throughout French Polynesia is involved and from the evidence of the drumming, we have heard every where, they have been getting together to practice for months. Each island sends their best choir and dance troop, accompanied with thier drummers to the final in Tahiti. Here on Tuesday night we watched the final village performing for the judges in the hope of being selected to represent Bora Bora. The dancing in particular was spectacular, performed by over thirty female and male dancers from the commune of Nunue. Dressed in dramatic costumes and wonderful headdresses they twirled, jumped and vibrated, to the frantic rhythm created by an exotic mixture of drums. One of the main moves involves the girls shaking their bums at a phenomenal rate, we sit transfixed. We all walk back to the anchorage trying to work out exactly how it’s possible to move ones hips like that, our skinny Caucasian bums are just not fit for purpose. It struck us just how much effort had gone into the performance, the actual dancing was only half of it. The communes here are small with populations in tens rather than thousands, just making the outfits that were changed for each of the five performances must have taken weeks of sewing, the stage backdrop represented an underwater scene and was at least twenty meters long and the band comprised of about twenty players, what a great way to create community spirit. A couple of nights later and we are again enjoying a musical performance, a local guitarist was playing in the Mai Kai Yatch Club bar. He was very good, apparently not keen on playing Polynesian music he sticks instead to the Eagles, Pink Floydd, Dire Staits……… He played with just his father backing him on base but had the knack of it sounding like there was a whole band inside the bar. Besides the sampling of the local musical offerings and the odd meal out its been a quiet week. Again the wind has been blowing enthusiastically, swinging the boat in all directions and making dingy trips rather bouncy. We did have one calm day, Saturday, so we, with a couple of other boats, followed Steve and Lili to a snorkelling site a couple of miles dingy ride away. 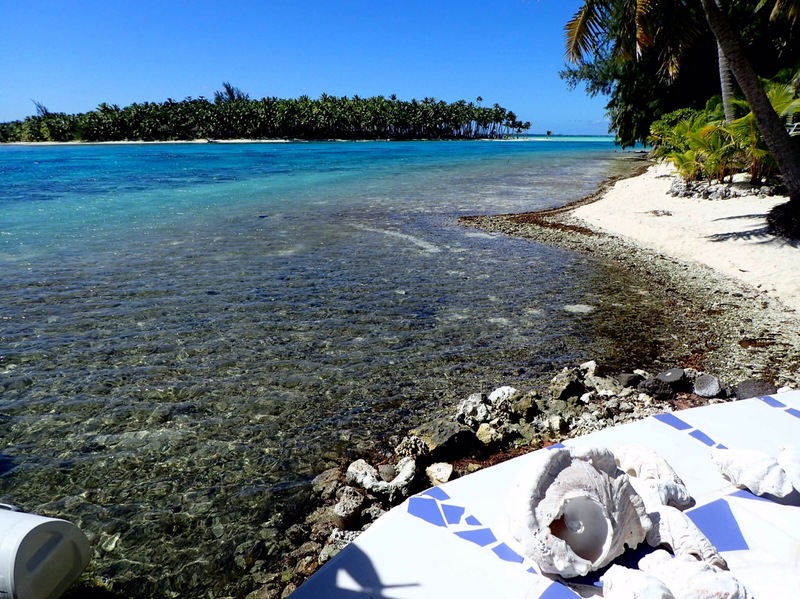 Steve and Lili from the yacht Liward have been cruising French Polynesia for three years, they love it so much they have just renewed their visa to stay for another three. As a result they know all the good places to go and took us all to a channel between two motu in the NW corner of the outer reef. On one of the islands was the charming small resort Blue Haven which kindly allowed us to tie up to their dock. The snorkel wasn’t quiet as amazing as the channel off Tautau but being bigger, had bigger fish including a six foot black tip shark that glided nonchalantly past about ten meters away. And I managed to get a photo of my new favourite fish. 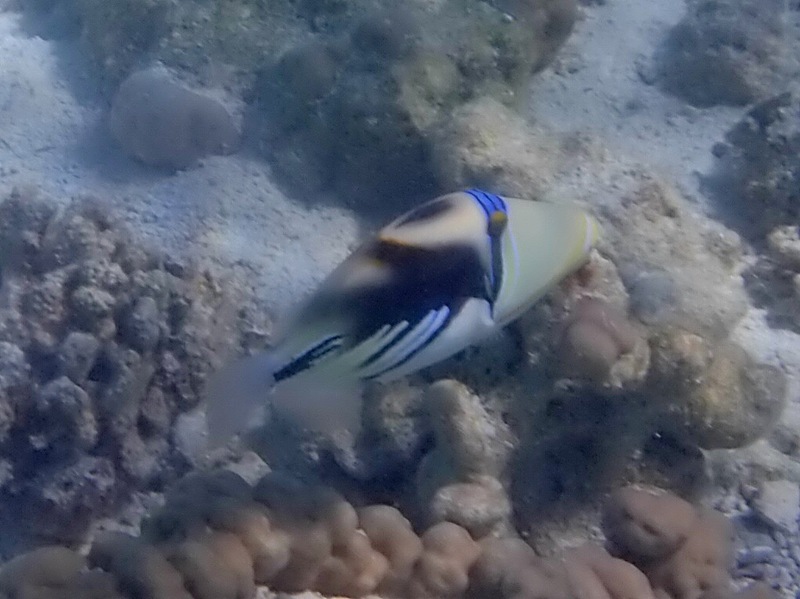 We have discovered its official name is white striped trigger fish, but for obvious reasons we had nicknamed him abstract art fish, we have just learnt the locals call him the Picaso fish. This entry was posted in Tahiti and the Society Islands by Roz. Bookmark the permalink.